Whether making a friendship bracelet as a gift for your closest friend, or organizing a party to make bracelets with a group of friends, the sentimental value of handmade bracelets is priceless! Just like every friend, each bracelet is unique, and can be made to fit your bestie’s personality, so take out your string and let’s get crafty with these easy-to-follow instructions below! Step One: Choose Bracelet Colors Your Bestie Will Love! Choose which colors you want to use for your bracelet. For ours we used pink, lavender, purple, and dark purple. The more strings you use, the wider the bracelet will be. Measure out one string using your forearm as a guide, from your wrist to your elbow. If you are making the bracelet for your friend, take into consideration the size of their wrist and increase or decrease the size as needed. Cut the string to be four times the length of your forearm, and leave a few extra inches of room for safe measures. It is better to have more string than less string. Use your first cut string as a guide to measure the remainder of your strings. All strings should be the same size. When you have finished cutting all of your strings (we used four total, one for each color), place all of the strings together, and fold your strings in half. This should leave you with two of each color. After folding the strings in half, create a loop. Tie the loop into a knot. Tape your loop onto a flat working surface such as a table. Spread out your strings so that the colors are symmetrical. To make the chevron stitch “V” shape you want to start from your left side (stitched from left to right) until you reach the middle, then work from your right side (stitched from right to left). The right and left side of the “V” stitch is completed by tying the two middle strings together, which should be the same color. Start with the left outermost strand (we used dark purple) and make a forward knot by crossing it over the next string (to the right) in a “4” shape, and looping it under and through the opening. Pull the string up to tighten the knot. Repeat this step again using the same string (in our case, dark purple). One stitch consists of 2 forward knots per string. Make 2 forward knots per string, until you reach the middle. Once you’ve reached the middle of the row, move to the right outermost strand. Create a “backward knot” by crossing it over the strand to its left and forming a “P” shape. Loop the strand under and through the opening of the “P.” Do this for each string until you reach the middle. Tie the two middle strands (which should be the same color) using either a forward knot or backward knot. Step Seven: Repeat Steps 5 & 6! Continue doing forward knots on the left side, and backward knots on the right side, until you are halfway done with the bracelet. You can check if you are halfway done by measuring with your own wrist. For a more visual explanation, check out our video for one row of stitches at the bottom of this page! Now that you’re at the halfway mark (congratulations! ), it’s time to add your flower beads! We only used one but you can add as many beads as you like. With that said, this step may vary depending on what type of beads you have, how many beads you use, and where you would like to place them. 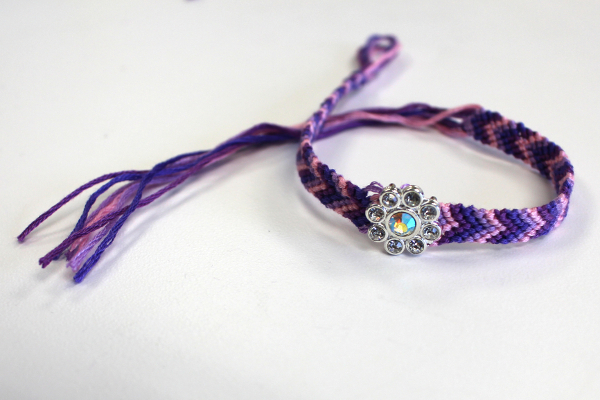 This bracelet is completely your design so have fun with it and be creative! You will want to place all strings through the one bead, so make sure your bead holes are large enough. Step Nine: Repeat Steps 5 & 6! Repeat steps 4 & 5 to continue the rest of the bracelet until it fits around your (or your BFF’s) wrist. Step Ten: Completing Your Very Own Friendship Bracelet! Take the remainder of the string and neatly smooth it out into one large strand. Take the large strand of strings and tie through the end of the loop to make it secure around your (or your friend’s) wrist. Step Eleven: Gift your cool new friendship bracelet to your best friend! Video: How to Make One Row of Stitches! Click here to return to Step 7.